My Girl’s Night.. or Pregnancy Pampering Essentials! If you’re not following me on social media, you probably missed the announcement I made about my pregnancy. It is part of the reason why I haven’t been as active in blogging and doing videos as I had intended to be. It has taken a lot of energy and motivation out of me which took me out of posting reviews, makeup tutorials and pretty pictures but the time off helped me find my love for it again and slowly but surely, I want to get back to a regular posting routine on the blog and social media. Being pregnant can take a lot of motivation out of you. I don’t doll myself up as much as I’d like to and I know it needs to become a priority. I received a package of girl’s night treats from Farleyco that are perfect for a night of pampering with the girls or if you’re pregnant and have forgotten to put your needs first. Eco Tools Facial Mask Mates / $10.99 CAD: A girl’s night always starts with a good face mask. I really don’t like getting that mask gunk on my hands, so this Mask Mates set of sponges and a handy brush are the perfect mates for applying a luxurious mask without having to wash your hands a billion times. It comes with a mask applicator brush and 3 mask remover sponges. The brush is made of bamboo and is cruelty-free, plus the bristles are super soft and the flat edge can easily apply anything from creams to gels to clay with even coverage, without the mess. The sponges are reusable and made of plant pulp, which helps to effectively remove masks while also gently exfoliating your skin. BeautyLash Brow Tint Kit / $19.99 CAD: When you have non-existent brows, you will do pretty much anything to get some that actually show up. I’ve tried dying my brows with hair dye but have never tried brow tinting before. This product also tints your lashes which I’m a bit more hesitant about doing. It’s a quick 2-step process that lasts up to 6 weeks and is smudge and water resistant. One box is reusable for up to 8 applications which is also amazing. The shades come in Light Brown, Medium Brown, Dark Brown and Black. I’m dying my hair soon now that I’m in the second trimester and it’s much safer at this point for me to do it, so I’m very excited to try this kit out! Modèle Collagen Lip Treatment (Plump) / $29.99: I don’t have the money to spend on lip injections and wouldn’t do that at this point in time anyways, so lip plumpers are always a fun thing to try out. This one helps restore volume to your lips, reduce the signs of aging and retain moisture. You can use it alone or underneath lipstick and should be applying at least 3 times a day for a minimum of 30 days to see results. When I first put it on, I immediately noticed that my lips were NOT tingling like most plumpers do. This is a very subtle plumper that feels more like a nice lip balm, so if you’re sensitive to that tingly/stinging feeling but want something that helps make your lips look a little more fuller, this is a great option. 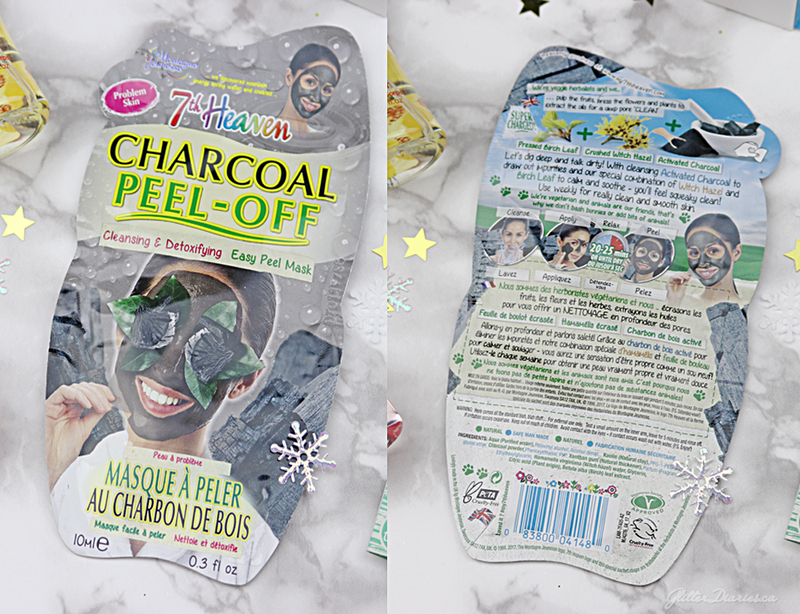 7th Heaven Charcoal Mud Face Masque / $1.99 CAD: I love doing a double mask on nights when I really want to pamper myself. I’ll start with a cream mask and then put on one that I can peel off. My skin feels more squeaky clean and refreshed when I do the double mask combo. 7th Heaven masks are a treat because they’re easy to apply and can target certain problem areas and make my skin feel really good afterwards. This 2 in 1 mask contains purifying natural charcoal and exfoliating walnut shell that work as a tag team to help detoxify your skin. The charcoal also helps absorb oil and impurities. I hate having clogged pores and love how effective charcoal is at helping keep them clean. MesmorEyes #406 Kit for Almond Eye Shapes / $12.99 CAD: Lashes are always something that make me feel prettier. I feel like I can wear lashes with minimal makeup and still feel good about myself. They’re also an essential to any girl’s night when you take your party from the comfort of your home to dinner or somewhere else to let a bit loose with the girls. This kit comes in different styles depending on your eye shape which is very helpful because most lashes come in a one size fits all style. The kit not only comes in a style perfect for almond eyes which works for me, but also those with monolids, round, and hooded eyes. the lashes in these kits are hand picked to suit those eye shapes and are hand knotted and feathered from 100% sterilized human hair, with comfort band technology so even someone who doesn’t wear lashes that often will feel comfortable in them. I love this kit because of the variety of looks I can get out of these lashes, plus they’re very easy to apply and wear. Purple Tree Coconut Miracle Balm / 25 ml / $6.99 CAD: Pregnancy has given me really dry and parched skin, so a good multi-use balm is a must have. This balm uses natural, organic coconut oil which help protect and provide relief from dry, cracked skin on your lips and anywhere else on your body. It’s a multi=use balm that can protect brittle nails and cuticles, tame unruly brows, and when applied to your lashes, can give them a longer more luscious look. It not only comes in yummy coconut but also aloe vera, pomegranate, and shea butter. I love multi-use products because I can use it anywhere to treat my dry skin. Even though the tube is somewhat small, the balm itself is thick and a little goes a long way. What do you think of my girl’s night/pregnancy pampering essentials? Have you tried any of these products out?! Share your thoughts below! Shopping online for Christmas gifts can be just as stressful as shopping at the mall when you’re faced with tons of sites to choose from and no clue where to start. Websites that carry multiple brands and different types of products are always at the top of my go-to list and Farleyco is one of them. They are your one-stop shop for anything beauty related from hair care to makeup and brushes to natural, eco-friendly products to even stuff for men, plus, it’s all very affordable and shipping is a breeze. Here are just a few of the great holiday stocking stuffer ideas I’ve rounded up from Farleyco that won’t break the bank. #1 – 7th Heaven Charcoal Peel-Off Mask / $1.99 for 1 or $7.99 for 5: Who doesn’t like products that pamper? Charcoal is still a very popular ingredient in skincare because it helps draw out impurities and dirt in your pores and the 7th Heaven Charcoal Peel-Off Mask is especially made to sink into your skin really deep and take out all of that gunk. These masks are the perfect, thoughtful stocking stuffer idea that will remind your friend or loved one that they need to schedule a night pronto to pamper themselves! #2 – So… ? Body Mists in Musk, Vanilla Milkshake & Pink Grapefruit / $4.99 ea. / 100ml: Getting a new fragrance to try out is always a nice gift to receive during the holidays but body mists are becoming more and more popular because they’re travel-friendly and easy for on-the-go touch ups after you’ve gone to the gym or to freshen up before a dinner date. Whatever the case may be, So… ? Body Mists are fun, lightweight and easy to wear no matter what kind of scent your giftee may prefer. Plus, you can gift someone with multiple scents like Musk, Vanilla Milkshake and Pink Grapefruit, for instance, because at $4.99 a pop for 100ml, you can’t go wrong with giving them options for different moods or settings they may want to freshen up for. These body mists are also not too strong, so they can be worn by someone with even a sensitive nose, plus you can buy these body mists for anyone on your list because they work for all ages. 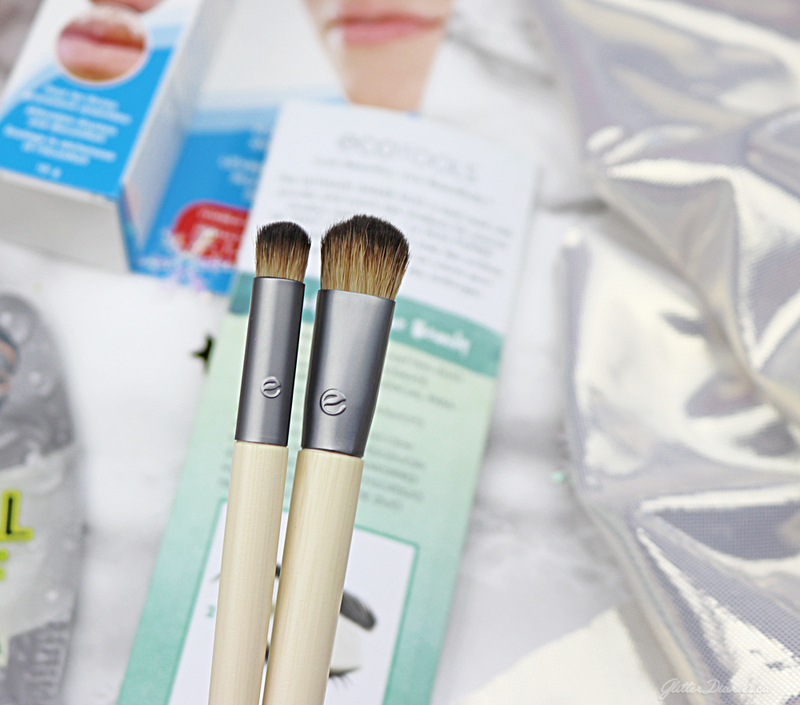 #3 – EcoTools Ultimate Shade Duo / $8.99: Even though I have tons and tons of brushes already, I can never get enough of owning more and I know every makeup lover is the same way. There’s something about the feel of a new brush that excites me which is what I felt with the EcoTools Ultimate Shade Duo. They are the ultimate duo for helping anyone create a perfectly shaded and blended eye look. The Full Shadow brush is used for applying base colours and highlights to your brow bone while the Precision brush adds accent colours and is perfect for using in your crease. The duo is very easy to use and is pretty much all you need to create a complete eye look which is why it’s the perfect gift for any makeup lover. #4 – Flexitol Lip Balm for Severely Dry Lips / $5.49 / 10 g: We all love buying things people want but it’s even more fun to buy things people NEED. Who really thinks of the little things when the holidays roll around, like taking care of annoying seasonal skincare issues like overly dry lips. I deal with dry lips as soon as the temperatures drop and found Flexitol Lip Balm for Severely Dry Lips so very helpful because products like that are always something I know I need to buy every winter but I never get around to it when I need to. 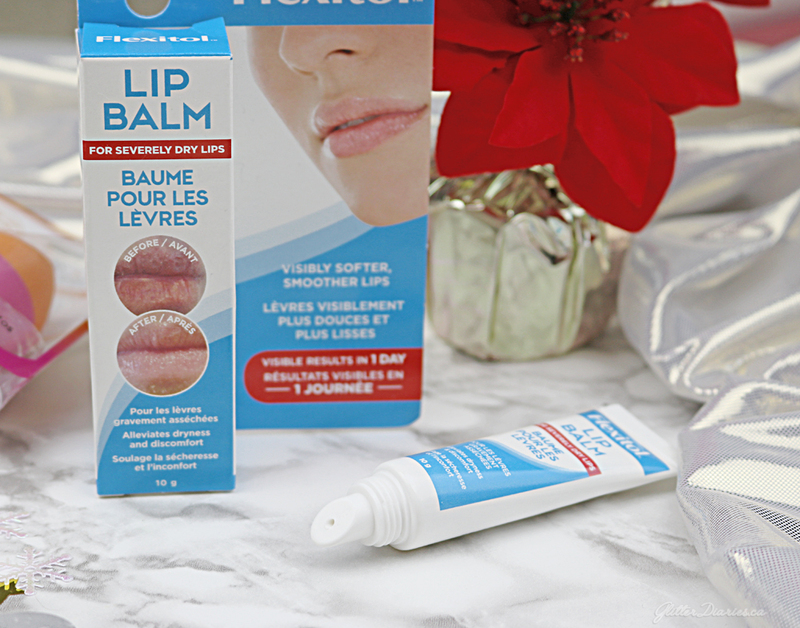 So, if you have someone who deals with the same problem come wintertime, this lip balm is a great gift idea because it comes formulated with 2.5% synthesized urea, which ensures deep penetration to alleviate soreness and discomfort while visibly softening and smoothing lips quickly. It’s got a great minty scent and a chiselled applicator for easy application. #5 – Real Techniques Dual Ended Expert Sponge / $10.49: I absolutely love RT sponges. They’re affordable and are just as good, if not better, than higher end sponges. The Real Techniques Dual Ended Expert Sponge is one of the newest and most exciting sponges they’ve released. It’s designed for medium to full coverage application of liquids and powders and is latex-free. The orange side works for applying foundation, while the pink side works with applying contour, highlight and blush. 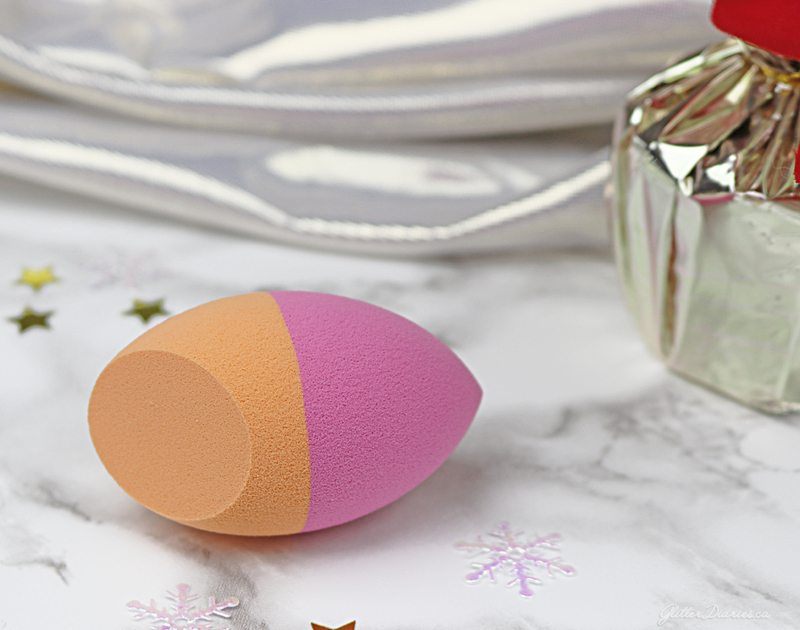 If the recipient on your list loves her sponges but needs some help with simplifying or downsizing their stash, this sponge is very handy and affordable because each side is part of two of their most popular sponges, their Miracle Finish Sponge and their Miracle Complexion Sponge which are $10.49 each, so you’re saving yourself from spending double that when you buy this sponge. 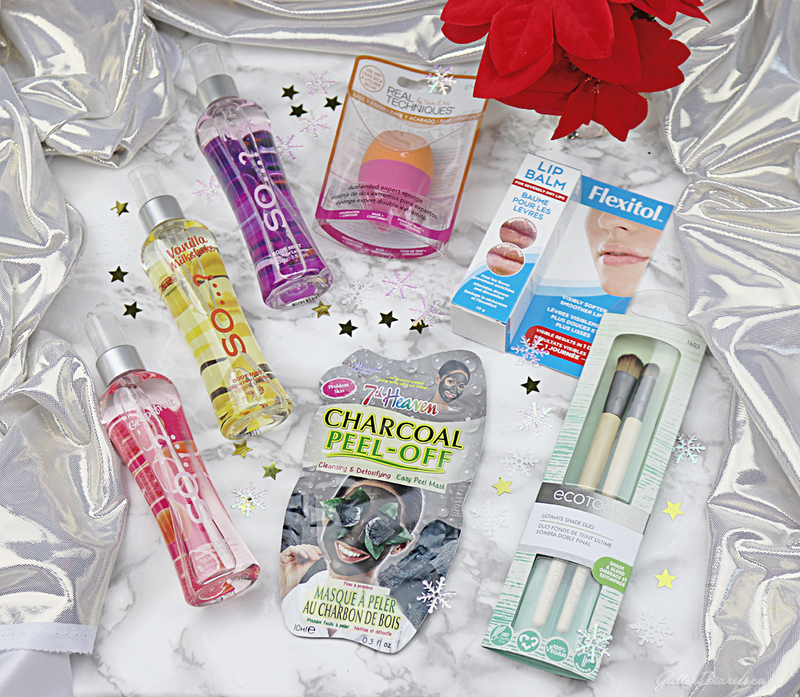 What do you think of these stocking stuffer ideas? What kind of gifts do you like buying as stocking stuffers?! Share your thoughts below! This is the first week of fall but it sure doesn’t feel like it outside. Over the past several days, we’ve had temperatures feeling closer to 40 with the humidity. Welp, I guess I’m going to have to wait to pull out my fall wardrobe for a little bit longer. No matter what it feels like outside, I like having a good end-of-season pampering session for the parts of my body that don’t often get pampering, like my feet. Even though fall is a time when sandals and open toed shoes are going to take a back seat to boots and regular close toed shoes, I still like treating my feet to a good summer to fall foot pampering session. Here are some of the products that were part of this year’s pampering routine. First things first, I’ve become more and more obsessed with masks of all kinds. Sephora has converted me into a mask collector and one of the kinds of masks that I absolutely LOVE using are foot masks. 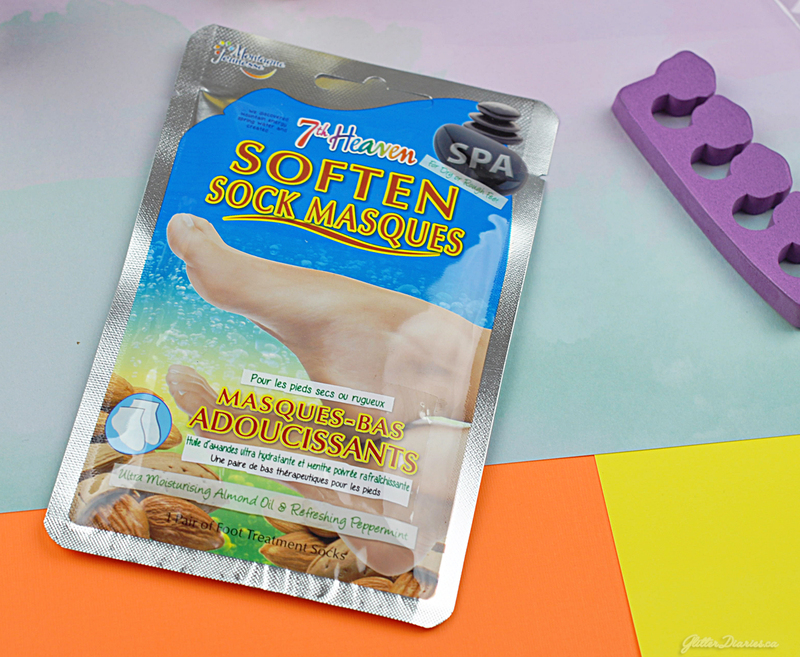 The 7th Heaven Soften Sock Masques ($5.99 / Available at Farleyco.ca & Rexall Pharmaplus) are like getting your feet pampered at the spa. They are booties that make your feet feel really soft and come treated with shea butter and almond oil, which nourishes dry skin and repairs cracked heels, and peppermint and soybean, which freshen and hydrate the skin making it feel silky soft. 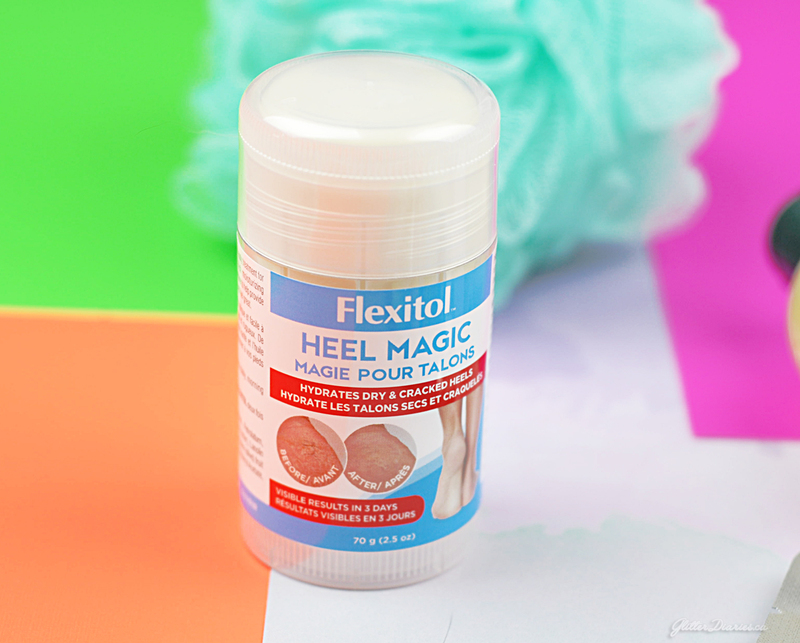 I’ve done a lot of walking this summer which has resulted in very dry, cracked heels, so to take it a step further in order to make sure my feet are in their best condition, I have been using Flexitol Heel Magic ($14.99 / Available at Farleyco.ca & Shoppers Drug Mart). It’s a new and innovative way to hydrate and nourish dry, cracked heels, which comes in a no-mess stick formula that contains a blend of urea, shea butter, lanolin and olive oil in a highly concentrated moisturizing base. It’s not always the prettiest thing to see but women get toe hair. I used to shave mine off until I discovered that you can easily just wax it off instead. Andmentics Toe Wax Strips ($14.99 / Available at Farleyco.ca) are safe to use at home and make waxing your little piggies a breeze. 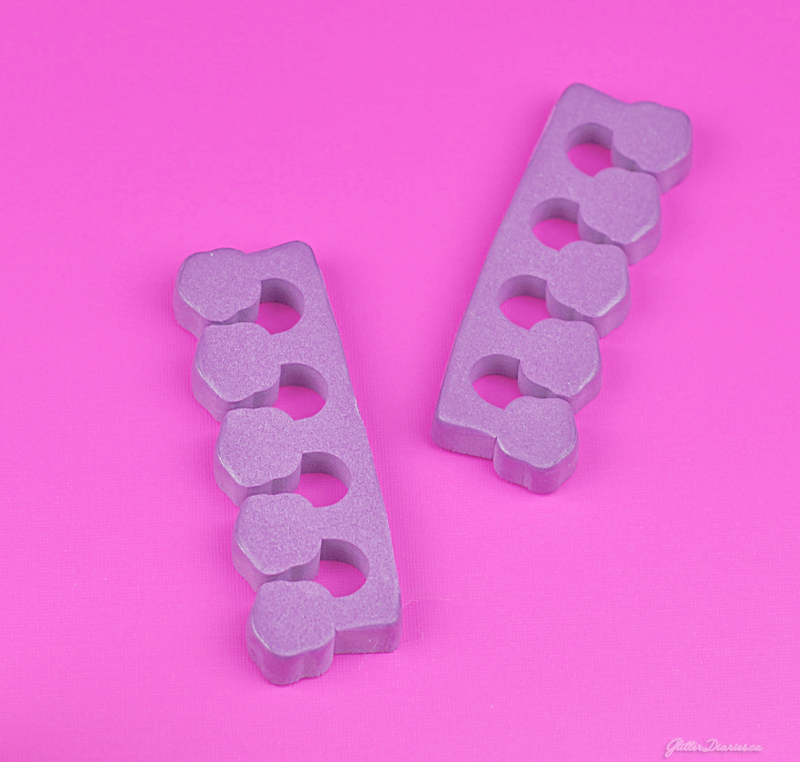 They are shaped to work on all toes and expertly removes all hair without irritating your skin. Using vanilla scented shower gels and bath foams are an obsession for me which is why I really love the cute mini bottle of I Love Vanilla & Ice Cream Bath & Shower Creme ($9.99 for 500ml / Available at Farleyco.ca & Shoppers Drug Mart). It’s great for travelling, smells like summertime and eating ice cream cones and makes your skin (and feet) smell and feel great. Lastly, you can’t complete a full foot pampering session without a good pedicure. I’m not the greatest at painting my toes, so a toe separator is essential. They keep your toes in place as you apply the nail polish and prevent any movement from happening afterwards so the polish doesn’t get smudged. Aside from this routine, I make sure to keep my feet moisturized and like slathering them in lotion before I go to bed (and just hoping that I don’t have to wake up in the middle of the night to pee). If you follow a routine like this and have a special evening once a month where you treat your feet and give them the love they deserve, they will look amazing all year round.